For filling, combine pineapple topping and rum extract in a small bowl. Spread evenly over the crust. For topping, stir coconut unto the reserved crumb mixture. sprinkle over filling. Bake in a 350 degree oven for about 30 minutes or until golden. Cool in pan on a wire rack. Cut into squares. If desired, drizzle with melted chocolate. Makes 48 bars. This is for a home made granola bar that got a lot of protein, depending on which breakfast cerial you use, and no preservatives. I hope you enjoy them! Preheat oven to 325 degrees. Line a 9x9x2 inch baking pan with foil. Coat pan with non stick spray, ste aside. In a bowl combine cereal, rolled oats, flour and dried fruits. Set aside. In a small bowl, stir together eggs, honey, peanut butter and melted butter or oil. Pour over cereal mixture. Mix well. Drop by ¼ cup onto prepared cookie sheet and flatten with back of spoon. Bake for 28-30 minutes or until edges are browned. Preheat oven to 350 degrees. Cream butter, shortening and sugars until light and fluffy. Add vanilla. Add eggs and combine. Combine flour, baking soda, and salt and gradually add to sugar mixture. Fold in chips and cherries. 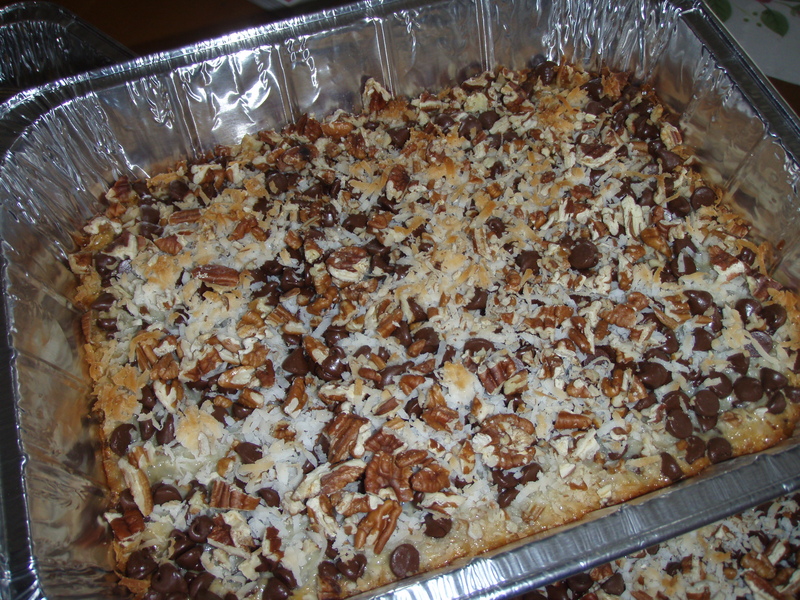 Drop by teaspoonful onto lined cookie sheet. Bake 5-7 minutes until golden brown. Remove to rack to cool. So I spent the day yesterday making Oreo’s. Although the official tasters(kids and friends) said the cookies were good, I wasn’t satisfied. They didn’t have a great chocolate taste. So back to the drawing board. I used the same filling, but here is the recipe I think is a winner. Combine chips and butter in a double boiler and stir often until melted. Add in cocoa powder, sugar and vanilla. Add in eggs and combine. Stir in flour, baking powder and salt. Drop by dime sized balls onto parchment lined cookie sheet. Bake 8-10 minutes in a 325 degree oven. Remove from oven, let cool 5 minutes and remove from parchment. Coat inside of cookie with frosting, top with another cookie and enjoy. Thanks everyone for your comments. Lorie is the winner. I am attempting to make oreo’s, so I will let the kids try them first and if they meet with approval, I will get those out to you. If not, I have another recipe I was going to do this month and I will make and get thouse to you. Coimbine all ingredients and form into dime sized balls. Place on cookie sheet and bake 8 minutes in a 350 degree oven. Combine all ingredients, spread on the back of one cookie and top with another. Congratulations Jackie. This month’s cookie is: molasses. This was one of the ones I can remember making with my grandma and I think my daughter’s favorite. Combine flour, baking soda, cinnamon, ginger, and salt in a bowl and set aside. Cream shortening, sugar and molasses. Add egg. Gradually add flour mixture to wet ingredients. Roll into balls and roll in additional granulated sugar. Place 2 inches apart on cookie sheet and bake 7-10 minutes until lightly browned.